Shirts With Random Triangles: Iraq War Graphic Novel "The White Donkey" Goes From Self-Publishing To Major Publisher. The graphic novel, inspired by events during Uriarte's first tour of duty in Iraq (including an incident involving a white donkey halting a military convoy, which inspired the GN's title) details the experiences of an enlisted Marine both in Iraq, as well as on the homefront. Uriarte, an US Marine veteran who served two duties in Iraq, created the online comic strip Terminal Lance in 2010. The strip, whose name is a term describing the difficulty for Marines with the rank of lance corporal to gain promotion. The strip began gaining a huge following among those with a military background as well as civilians as it detailed life in the enlisted ranks in sometimes lurid and raunchy fashion. Around the same time, he began developing The White Donkey as a graphic novel. 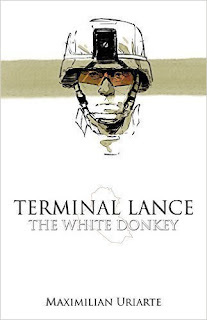 The two projects share characters Abe and Garcia, two Marines who began life during The White Donkey's development, but began appearing as regular characters in Terminal Lance in 2010, eventually becoming the center of the strip. The first printing of The White Donkey was self-published by Urarite with financing from a Kickstarter campaign. The graphic novel quickly sold out following its release on Amazon on Feb. 6. The White Donkey received some major media attention before it's publication, with articles in The Washington Post, and The Houston Chronicle, and The Wall Street Journal.